Forced data localisation measures are on the rise around the world, fragmenting the Internet and increasing costs for businesses and consumers. Until the year 2000, only 15 measures were imposed globally. By 2007, the number of measures doubled and it more than doubled again until today. 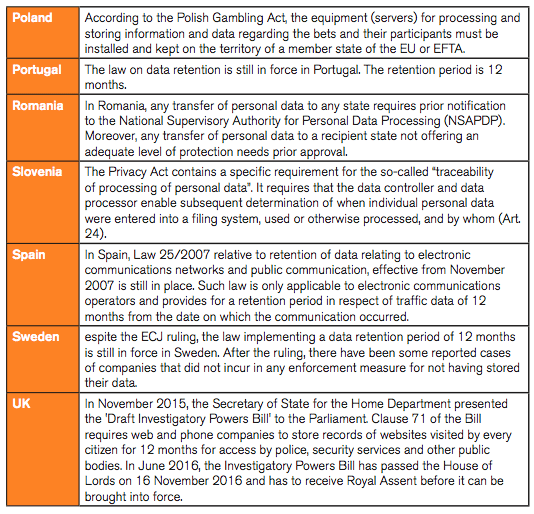 The study has identified 22 data localisation measures where European Union Member States impose restrictions on the transfer of data to another Member State. The most common restrictions target company records, accounting data, banking, telecommunications, gambling and government data. In addition, there are at least 35 restrictions on data usage that could indirectly localise data within a certain Member State. A real EU Single Market on data storage is yet to come into function in practice: Two-thirds of all demand for “ICT-related” services (consulting, hosting, development) are sourced locally within each Member State, while only 18% is sourced from the rest of the EU. Meanwhile, the cost difference of operating data centres can be considerable amongst the EU Member States, with the most expensive country being twice as expensive as the cheapest. Data localisation measures create a major misallocation of resources and threaten the continent’s productivity and competitiveness. If data can be stored and processed anywhere within the EU, the move would boost the commitment to achieve a true Digital Single Market and send a clear political message that Europe is open for business. If existing data localising measures are removed, GDP gains are estimated to up to 8 billion euros per year (up to 0.06% of GDP), which is on par with the gains of recent free trade agreements (FTAs) concluded by the EU. These gains approximate the impact of a fully price-transparent “industrial” DSM. Even more striking gains from a ban on data localisation will stem from the ratchet effect – preventing EU Member States from imposing harmful data localisation measures in the future. The economic loss generated by full data localisation by each of the Member States would lead to a loss of EU-wide output by 52 billion euros per year (0.37% of GDP). This number will increase with further digitalisation of the European economy. ECIPE gratefully acknowledges the support for this paper from Computer & Communications Industry Association Europe (CCIA Europe). The online environment has rapidly become one of the most regulated areas of social and commercial interactions, often surpassing their traditional offline counterparts. Whether the objective is to protect personal data, tax revenues, or essential infrastructure, the sovereign is increasingly active in seeking continued jurisdiction over online activities of their citizens and firms. At times, it is not acting to fill a legal void but using disproportionate means to repatriate consumers and firms who use the internet to trade with or from other countries. Perhaps one of the most draconian measures is data localisation, where governments are requiring mandatory storage of critical or trivial business data on servers physically located inside their territory. Whether the pretext is “restoring confidence” in the online commercial environment – or just plainly to “level the playing field” between domestic players and foreign competitors – data localisation effectively disrupts cross-border data flows and consumer access to online services. Meanwhile, production chains are increasingly digitalised. Even trade in goods and hard commodities – from cars to raw materials – depend on data access; various types of consumer services that were considered “untradeable” less than a decade ago are now exchanged online. As the global policy environment inclines towards “data nationalism”, data localisation has become an effective non-tariff barrier (NTB) to trade (Chander, Lê, 2014). Previous literature established also that data localisation results in clear economic costs for the implementing economy, primarily through significant losses in productivity and competitiveness. Europe – as an export-led services economy under considerable competitive pressure – stands more to lose from such losses. Meanwhile, data localisation measures rarely contribute to their alleged policy objectives, as information security is not a function of where the data is physically stored. Whereas there are strict restrictions on data flows from the EU to other countries, there are fewer restrictions imposed on internal flow of data between EU Member States thanks to the existing Single Market disciplines on services. Nonetheless, a real Single Market on data storage is yet to come into function in practice: Two-thirds of all demand for “ICT-related” services (consulting, hosting, development) are sourced locally within each Member State, while only 18% is sourced from the rest of the EU. The policy package under the Digital Single Market (DSM) includes consumer-driven initiatives such as a European Cloud as well as the prevention of “unjustified” geo-blocking as well as cross-border content portability. To augment DSM with a ban on “unjustified restrictions on the location of data for storage or processing purposes” as envisaged, would create an industrial dimension to free flows of data, which the DSM strategy currently lacks. The policy context for such intra-EU discipline on data localisation measures is favourable and timely. An EU-wide discipline against data localisation that would not impair on the protection of personal information – and given the passing of General Data Protection Regulation (GDPR) ought to be depoliticised, or to the extent the issue could ever be in the European discourse. A data localization ban would not change or affect the privacy rules under GDPR, which already asserts free flow of personal data within the EU. Indeed, the current window of opportunity allows the EU to act before the EU Member States enact measures that could hurt other Member States and further fragment the Single Market. The policy is also a matter of public communication: Despite the efforts of DSM (supplemented even by fiscal measures), the business is not yet fully convinced about the investment climate in Europe. Tech investment in Europe is rapidly catching up, reaching $8bn per year – which is still less than half of what Silicon Valley attracts from venture capitalists alone. A ban on data localisation measures is not only a guarantee that innovators of cloud technologies, big data and other new innovations are able to gain ground and scale up within Europe – it would also restore some of Europe’s credibility as a force to keep the global markets open. If the EU Member States follow the global trend towards data nationalism, then the DSM and the Single Market would have very little value in practice. An economic assessment of policies on the digital economy are perilous endeavours, fraught with several methodological issues. This study builds on the methodology developed by the authors, which is accepted on methodological grounds, using a computable general equilibrium (CGE) model, which is a well-acknowledged methodology that is frequently used for trade and economic impact assessments by academia and policymakers worldwide as well as the European Commission. The impact of intra-EU data localisation is estimated in two parts: Firstly, the study looks at the liberalisation of existing regulatory data localisation measures (outlined in section two), given that the measures are also reasonably actionable. In addition, the study looks to the impact of economy-wide data localisation requirements imposed by each of the EU Member States to estimate the nominal economic damage that a data localisation ban would prevent. Notably ECIPE 2014, 2015; US Chamber of Commerce, 2013. General Data Protection Regulation 2016/679 (Regulation 2016/679 of the European Parliament and of the Council of 27 April 2016 on the protection of natural persons with regard to the processing of personal data and on the free movement of such data, and repealing Directive 95/46/EC). OECD, Trade in Value Added (TiVA) Database, 2015. European Commission, Proposal for a Regulation of the European Parliament and of the Council on addressing geo-blocking and other forms of discrimination based on customers’ nationality, place of residence or place of establishment within the internal market and amending Regulation (EC) No 2006/2004 and Directive 2009/22/EC, COM(2016) 289 final 2016/0152 (COD); on ensuring the cross-border portability of online content services in the internal market, COM(2015) 627 final 2015/0284 (COD). van der Marel et al., 2015 and Bauer et al., 2014. See, e.g., Economic Impact Assessments conducted by Francois, 2013 and 2007. Access to foreign markets through trade liberalisation and globalised supply chains are major sources of growth, job creation and new investments. Given the nature of today’s interconnected economy, Member States’ policies that increase data storage and processing costs have an economic impact beyond telecoms and the internet. Manufacturing and exports are already, and increasingly, dependent on having access to a broad range of services at competitive prices – such as logistics, retail distribution, finance or professional services, which in turn are heavily dependent on secure and efficient access to data across a reasonably large area. When data must be confined within a Member State (that are mostly small or mid-sized economies), it does not merely affect internet-related services, but potentially any business that uses the internet to produce, deliver, and receive payments for their work, or to pay their salaries and taxes. Many current restrictions are non-regulatory in nature, i.e. organisational decisions by individual firms rather than laws. For example, a bank or a public hospital may decide that its application vendors must store all its data on the premises, although there are no such obligations legally. However, the scope of this study is on those regulations which affect cross-border flow of data within the Single Market – in other words, law and decrees that blocks data transfers internally within the EU. Many of today’s restrictions are related to what certain EU Member States consider to be its vital national and fiscal interests, and uneasiness about data not being made available to its law enforcement or tax authorities upon request. Given that outright blockages to transfer of data would contravene EU’s Four Freedoms and existing EU disciplines, several of today’s intra-EU restrictions relate to the national security exception, granting national security as “a sole responsibility of each Member State”. However, the Court of Justice of the European Union (CJEU) has reiterated in several rulings that such exception should be applied strictly and that the Member State requesting such exception should “prove that is necessary to have recourse to that derogation in order to protect its essential security interests”. While data localisation measures relating to public security, defence and state security clearly fall outside of the scope of EU law, such objectives cannot be used routinely or carte blanche to get out of Single Market commitments. Another policy objective for localisation relates to data protection. 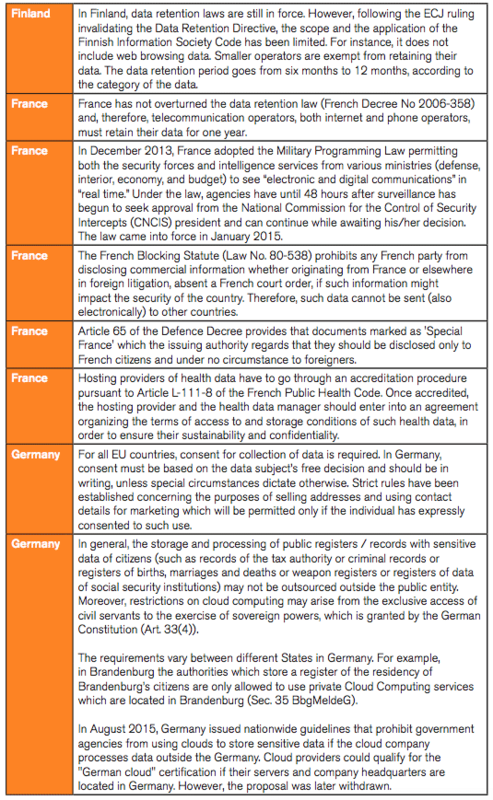 The EU has a common set of data protection rules since 1995. In recent months, the GDPR was adopted by the European Parliament and will enter into force by mid-2018. Given the harmonisation of privacy legislation across the EU under the GDPR, privacy can no longer be a concern for intra-EU data flows. The current and coming data protection regime in the EU remains quite diverse, yet – at least on paper – data should be allowed to flow freely within the Single Market. Nonetheless, Member States have imposed a series of additional requirements – most of which predate the 1995 European Data Protection Directive. See ECJ, European Commission v Italy, C-239/06, 15.12.2009, para 50; ZZ v UK Secretary of State of the Home Department, C-300/11, para 61, 4.6.2013. European Commission v Italy, para 46; ZZ v Secretary of State of the Home Department, para 45. Those regulatory regimes for which data is required to remain within a certain jurisdiction – and therefore cannot cross the border – are defined as data localisation or data residency requirements. The last decade has seen a worrying increasing trend of data localisation worldwide (Figure 1). Source: ECIPE Digital Trade Estimates, 2016. The oldest measure – which actually pre-dates the internet, but was later enforced online – was implemented as early as 1961. Until the year 2000, only 15 measures were imposed globally. By 2008, the number of measures doubled and it more than doubled again until today. Although data localisation measures share a common denominator in the objective to forcefully keep data within a certain jurisdiction, their intrusiveness can vary. The implementation of such requirements could be merely a requirement to store a copy of the relevant data somewhere within the national territory, which may seem as a relatively light restriction on cross-border trade. 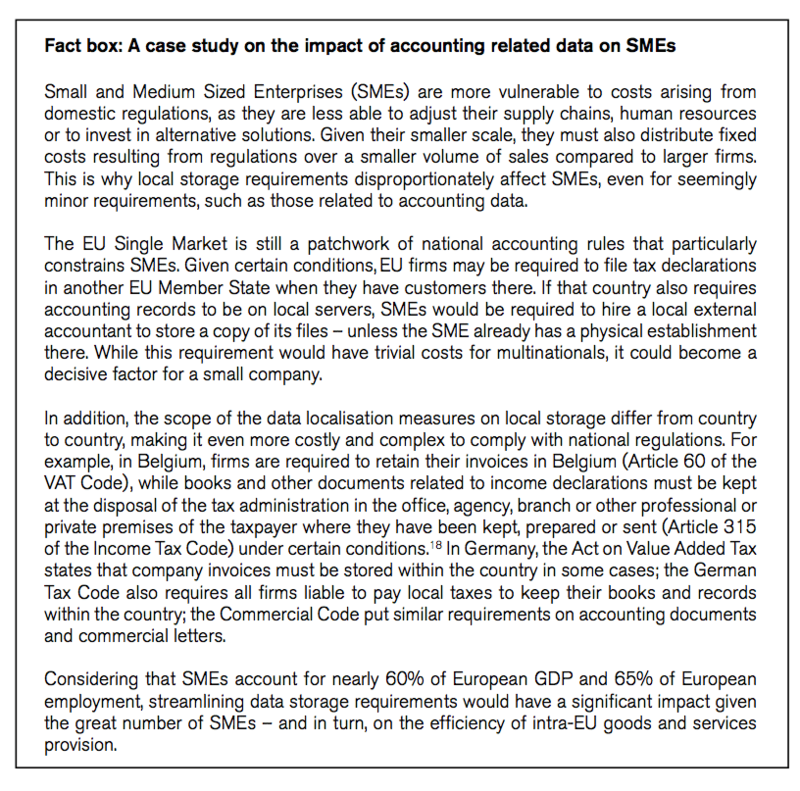 In reality, firms rarely have the financial overhead to store business data on multiple locations, why even a storage requirement bars firms and governments from using suppliers from other EU Member States. In more restrictive cases, individual EU Member States impose outright prohibitions on processing or transferring the data overseas. This forces the firm to use, process and analyse their data inside the national territory. Such measures could make it de jure and de facto impossible to use foreign suppliers, and even prohibit copies of certain data to be transferred cross-border – for example to a wholly-owned subsidiary or offices in another EU Member State. One special form of processing and transfer restrictions are laws that stipulate restrictive conditions for transferring data overseas. Under such regime, data cannot flow to another EU Member State unless the firm fulfils certain conditions. In most of such cases, there are multiple and overlapping conditions that must be fulfilled, such as security standards, government approval or strict requirements on consent. The most common requirements relate to accounting information and financial statements. 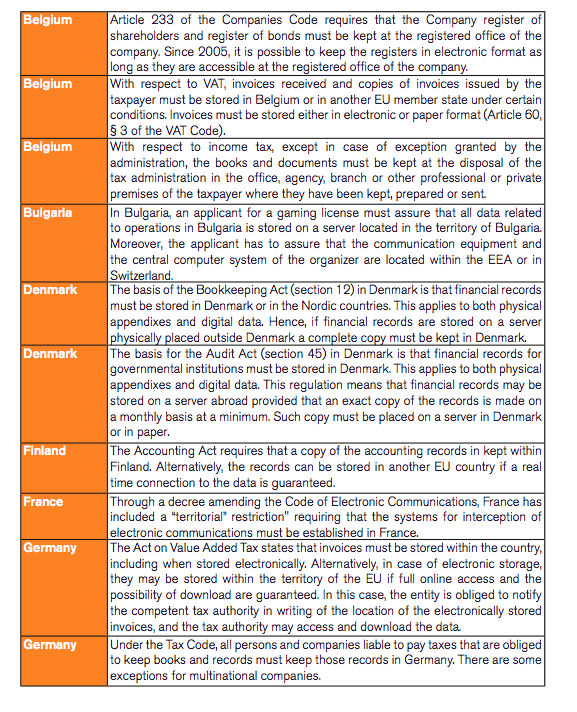 Such requirements can be quite extensive as in the case of Germany – where all invoices, books and records, accounting documents and commercial letters are required to be stored in the country, albeit subject to certain exceptions; another example is the Danish Book Keeping Act, which requires that companies’ financial records must be stored in Denmark, or in one of the Nordic countries. In case the records are stored on a server physically placed outside Denmark or on the cloud, a complete copy must be kept inside Denmark. Similar requirements are found in Belgium, Finland, Sweden and the UK. The second most common area concerns gambling. 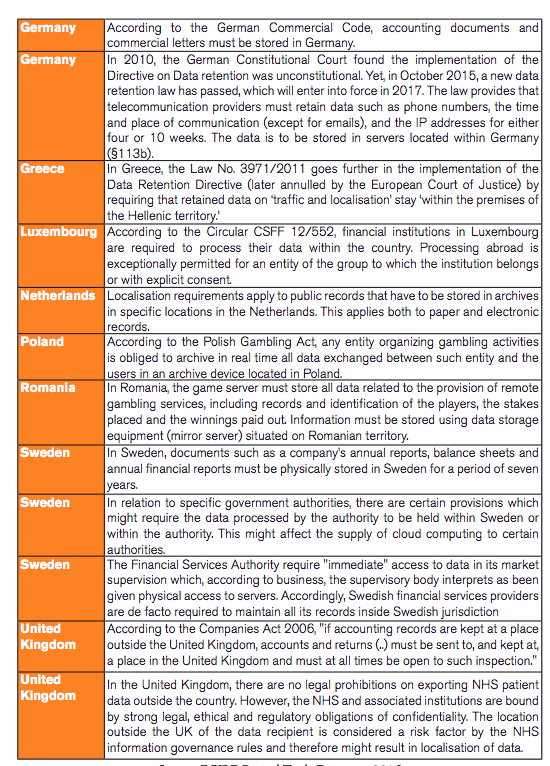 In three European countries (Bulgaria, Poland and Romania), data localisation requirements are imposed on winnings and user transactions. In Bulgaria for example, an applicant for a gaming license must assure that all data related to operations in Bulgaria is retained on a server located within the country, whereas the communication equipment and the central computer system may be located within the European Economic Area (EEA) or Switzerland. General stipulations on publicly held records are imposed in Denmark, the Netherlands, Sweden and the UK. This is often limited to a specific set of data, as in the case of Denmark, where only financial records for governmental institutions must be stored within the country; in the Netherlands, the requirements apply to all public records; in the UK, overseas processing of healthcare data held by the National Health Services (NHS) could be restricted by its information governance rules. In France, the decree amending the Code of Electronic Communications includes a ‘territorial restriction’ requiring that the systems for intercepting of electronic communications must be installed and all data must be processed in France. 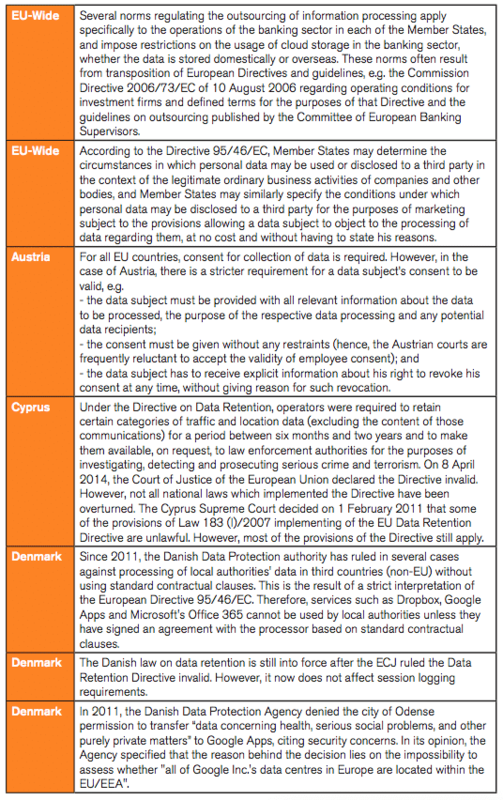 Also, in some Member States, there are data retention requirements that are designed as data localisation measures. Such requirements persist despite the invalidation by the European Court of Justice (ECJ) of the Directive on data retention. The Greek Law No. 397/211 goes further in the implementation of the Data Retention Directive by requiring that retained data on traffic and location stays within the Hellenic territory; Germany has recently passed a law with similar effect. The financial supervision authority in Luxembourg requires client data to be stored and processed locally; Sweden (with possibly other Member States) requires immediate access to data held by a financial institution, which is interpreted as authorities must have immediate physical access at the location, and therefore require that certain data remain within the territory. Data localisation measures are not the only measures impacting the flow of data. There are several other measures which prevent data to flow freely, regardless of whether the data crosses or not borders. Several of these measures also apply within the European Union and they often refer to cloud computing applications or to data from the telecommunications sector. Most of these indirect measures are likely not actionable under the Digital Single Market strategy: They lack an explicitly geographical element that makes a distinction between domestic and other EU undertakings that apply in a horizontal manner to domestic and foreign companies alike. Such indirect measures have not been included to the scenarios we analyse in this paper. For a comprehensive list of other restricting measures on the use of data that implicitly and indirectly lead to data being stored in a certain jurisdiction is listed in Annex II. ECIPE Digital Trade Estimates, 2016. See De Brauw, Blackstone, Westbroek, 2013. This study builds on two scenarios. The first scenario – denoted as the liberalisation scenario – assumes that the regulatory data localising measures outlined in the previous section are liberalised. Specifically, the economic impact of liberalising the existing directly and explicitly data localising measures is estimated on the basis of two different methodological approaches. Second, the study looks at a scenario where cross-border data flows within the EU would be restricted by all EU Member States, imposing data localisation requirement across the EU thereby effectively ceasing the cross-border use of online applications and data. The negative economic loss from data localisation determines the value of the preventive measure of banning such practices internally within the Single Market like a ratchet clause – hence, the scenario is denoted the ratchet scenario. This scenario builds on previous work of the authors, but is limited to the localisation barriers alone without other administrative requirements (e.g. compliance costs for data privacy regulations), which were within the scope of the previous studies. The extent of unnecessary economic losses caused by direct and explicit localisation measures is determined by a series of factors. Firstly, firms and public services that were previously required to store and process data within a certain Member State would have access to lower prices for data services “produced” in other EU countries. The economic savings for these firms or public services are the result of static effects from lower costs and a more efficient allocation of resources across the economy, which would improve the individual firms’ productivity, and in turn boost competitiveness, lower prices, and increase domestic and foreign demand. The first approach assumes a reduction of prices as the lower price available in the other EU Member States becomes available. The cost changes are implemented as ad valorem equivalents (AVEs), while assuming that the bias for domestic suppliers vis-a-vis foreign suppliers is assumed to be unchanged. In other words, the buyers’ preference for local suppliers (due to proximity, established commercial relations, currency risks, language barriers) remains. This approach approximates the trade effects under a fully price-transparent “industrial” DSM. The second approach considers a productivity improvement in the economies where the use of data storage or processing from another EU Member State was previously restricted. Such costs and their effect on total factor productivity (TFP) can be measured in real-life surveys and indirectly through econometric techniques. These costs are passed on downstream to customers – who may be manufacturers, exporters, a public agency, or private households – and further reduce productivity. The effect is factored by severity of the existing localisation measure, depending on whether the measure imposed is a storage or processing requirement, and the type of data that is affected. Similar to the first scenario, the sectoral scope of the current localisation measures is taken into account. Both approaches to the liberalisation scenario compare the cost of using data, i.e. processing, managing and administrating data, as well as building or leasing data centres. The cost difference storing data can be considerable amongst the EU Member States – with a variance up to 120%, more than twice the cost in the most expensive Member State compared to the cheapest. It should be noted, however, that the assessment of prices of data storage and processing is complex and difficult to generalise: the actual costs vary depending on actual set-up and scale; unlike generalised commodities like oil, the cost of data storage or processing varies highly within an economy. The prices are approximated through the general cost levels of inputs going into operating services – including energy, land prices, bandwidth, ease of doing business. Risk and policy factors are also accounted for, but given considerably lower weights. Both approaches also look to a number of important dynamic effects from the trickle down of price changes throughout the economy: data storage accounts for up to 1.9% of the inputs used in producing services – with ICT consulting activities, software and connectivity provision, the importance of data-related activities increases up to 31% of services inputs. Moreover, the impact of price changes affects also the prices outside the ICT sector. In both approaches, the impact also depends on whether the restriction relates to mere local storage requirement or local processing. The “ratchet” effect scenario estimates the impact of economy-wide data localisation requirements imposed by all 28 EU Member States. This is the overall nominal value of the economic damage that a data localisation discipline could prevent. In this scenario, it is assumed that firms can no longer use their IT infrastructure, application suppliers or data centres located in another EU Member State to process the data collected in a certain Member State. Therefore, data centres must be set up, or outsourced to a local service provider in each of the Member States by both foreign and domestic enterprises. This increased cost is passed on to the customers, who may be manufacturers, exporters or final consumers. This leads to productivity losses for various sectors and downstream industries. As often with all type of scenario analysis, this “worst case” scenario may not be realised. However, determining which EU Member State, or which sector that may be subjected to data localisation in near future would be purely speculative. Therefore, it is preferable to have a clear scenario based on maximum potential economic damage, prevented by a data localisation ban. Similar to the TFP approach under the liberalisation scenario, the ratchet scenario builds on the observed relations between price increases of inputs and TFP at industry level for domestic firms, based on previous work on data localisation by the authors. Unlike the previous studies, it builds on actual cost levels as observed in the EU and it only includes the productivity loss element, whereas previous studies built on a conceptual model that included compliance costs for privacy regulations (GDPR) and miscellaneous dynamic effects from investments and R&D. US Bureau of Economic Analysis, Input and Output Accounts Data, 2007. Source: Own calculations based on GTAP8. The two alternate approaches used under this scenario create a span in GDP gains above, where notably Luxembourg is a potential outlier given the size of its financial services sector relative to its economy. Furthermore, one of the approaches (the so-called AVE based approach) also assess the impact from lower prices for data storage and processing (based on differences against lowest prices registered in the EU), while buyers’ preferences for sourcing such services locally is left unchanged. This simulation is a close approximation of increased competitive pressure under a fully price-transparent “industrial” DSM, generating GDP gains up to 0.06%. 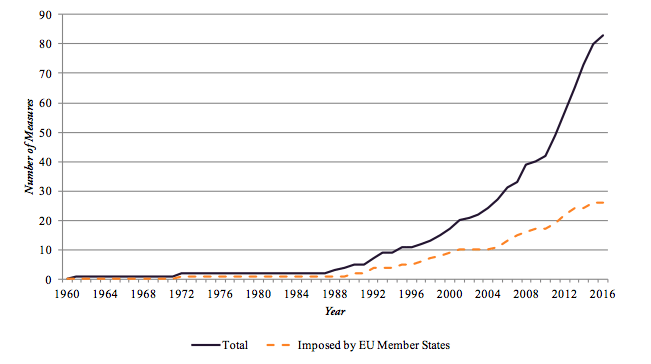 In absolute numbers, the overall EU-wide weighted impact is up to 8 billion euros yearly based on current EU GDP. The true cost of today’s restrictions is likely to be underestimated given that this scenario does not take into account the regulations that are implicitly or indirectly localising data. It is worth noting that the impact of these price adjustments would not lead to a large-scale outsourcing of data hosting and processing services to other EU Member States. Imports of communication services by German customers from other EU Member States would increase within a range of 2~8% above today’s levels; or 2~14% in the case of France. In all other cases, the import increase on communication services are limited to between zero and 3%. The lion share of the economic gains from a ban on data localisation are derived from the ratchet effect – i.e. from preventing EU Member States from imposing economically harmful data localisation measures in the future. In this scenario, it is assumed that each EU Member State imposes a regulatory requirement to store and process data locally, applied erga omnes – including other EU Member States. 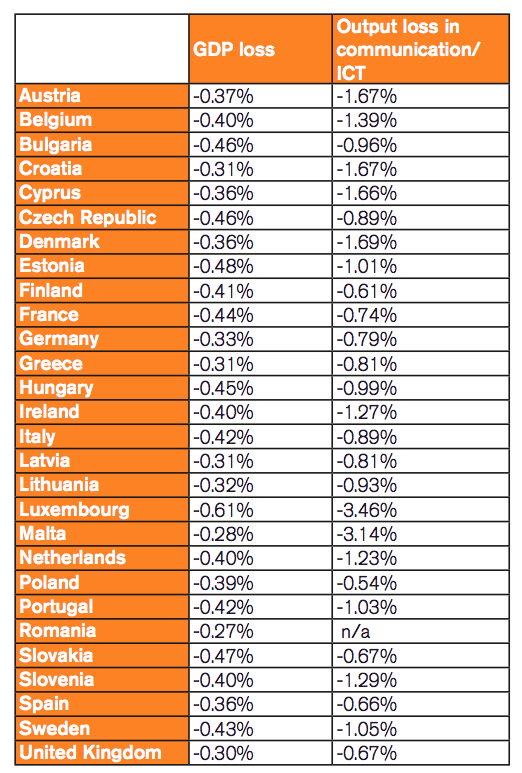 The GDP impact falls within a relatively narrow range of -0.27% (in Romania) to -0.61% (in Luxembourg) . The variance largely reflects the structural sectoral composition (i.e. the prominence of data-intensive sectors) or the service dependency of the economy. The overall EU-wide weighted impact is approximately 0.4% or 52 billion euros annually. The output losses are notable across all services sectors and Member States. However, they are particularly pronounced in the communication sector. In other words – data localisation measures are unlikely to support domestic ICT and telecom sectors through diverting local business and job opportunities to local market actors, displacing their EU or foreign competitors. The productivity losses in the economy generate much bigger losses throughout the economy, i.e. the economic loss resulting from forgone economic activities considerably exceed the marginal economic gains from protecting domestic data and communication sectors. IMF, World Economic Outlook, 2015. Data localisation policies come at severe costs, often being counterproductive to the alleged policy objectives. In the short-run, forced data localisation causes losses of firm-level productivity, higher prices, decreases in competitiveness, fewer jobs and lower economic activity. In the long-run, data localisation makes a country less attractive to foreign investment, giving arise to local oligopolies, encourages consumer lock-in effects that deprives an economy of its innovative potential. The effects of liberalising existing measures are at 8 billion euros per year, on par with the effects of recent free trade agreements that the EU has concluded, including the EU-Korea FTA and Comprehensive and Economic Trade Agreement (CETA) with Canada. However, the greatest economic impact is from preventing the Member States from being drawn into the global policy inclination towards “data nationalism”. The effects of such ratchet – equivalent to 0.37% of EU GDP – is worth six times more than the liberalisation of existing Member State measures. In the long term, the political imperative goes beyond just the digital economy: as goods, services and investments rely increasingly on effective, real-time sharing of data and use of applications across the Single Market, Europe would be eroding its internal market and effectively roll-back on existing Single Market commitments. If the use of data-related inputs to the industry are doubled in the near future, up to 0.8% of EU GDP could be at stake. As convincing as this economic threat is, more is at stake: Even in the immediate short term, a ban on data localisation is a powerful political message that the Single Market is open for business. This is how this policy initiative finds its most convincing rationale – by delivering an assurance of legal certainty for EU business going forward, and that the Member States will withstand the global trend towards localised data. A ban on internal data localisation in the EU draws the line on future attempts to roll back on the commitment to keep the Single Market seamless across Europe. This argument is particularly pertinent as the EU seeks to convince the market and turn the tide on the digital investments, and both inward and domestic investments into Europe’s digital economy are withheld or diverted to other regions. Ultimately, whether the EU will succeed in creating a DSM that benefits the consumers and the industry depends on whether the EU will withstand the trend towards data localisation. However, the current window of opportunity to act – while the internal Member States’ measures remain relatively few – is not likely to last for long. The EU-Korea FTA was expected to generate 0.03% to 0.08% of EU GDP (see Francois, Economic Impact of a Potential Free Trade Agreement (FTA) Between the European Union and South Korea, Copenhagen Economics, 2007; also Decreux, Milner, Peridy, The Economic Impact of the Free Trade Agreement (FTA) between the European Union and Korea, CEPII/ATLASS, 2010); EU-Canada FTA (CETA) is assumed by the contracting parties to generate 0.08% of EU GDP (European Commission, the Government of Canada, Canada-EU Joint Study, Assessing the Costs and Benefits of a Closer EU-Canada Economic Partnership, 2008). The model applied in this study is GTAP 8, a computable general equilibrium (CGE) model. The model is frequently applied by academia and international institutions including the European Commission’s DG Trade to estimate the impact of regulatory changes on a broad set of macro-economic and sector-specific economic variables. The model setting accounts for inter-sectoral linkages between 129 regions while capturing inter-regional trade flows of 57 commodities. The framework thus allows for a general equilibrium analysis of the economic effects (e.g. GDP effects and changes in trade flows) resulting from the regulation of cross-border data flows in the EU28. In this model, regional production is characterized by constant returns to scale and perfect competition. Private demand is represented by non-homothetic consumer demands. The structure of foreign trade is based on the so-called Armington assumption, which implies imperfect substitutability between domestic and foreign goods. The dataset includes national input-output data as well as trade, tariffs and demand structures. The model’s base data are primarily benchmarked to 2007. Like any applied economic model, this model is based on a number of assumptions. In order to account for recent changes in regional macroeconomic variables, the dataset on the global economy is extrapolated to 2016. The exogenous variables used for the extrapolation are macroeconomic variables, i.e. the size of GDP, total population, labour force, total factor productivity and capital endowment as provided by the well-recognised database of the French research centre in international economics (CEPII). We apply the estimates of these macroeconomic data projections in order to calculate the ‘best estimate’ of the global economy in 2016. Preferences and production structures as described by the model’s structural parameters have been left unmodified. The model applied in this study is comparative static. It does not account for endogenous productivity growth and may thus under-predict welfare effects, growth in economic activity and increases in trade flows that result from data regulation-induced sectoral productivity changes. Our estimates on data regulation-induced changes in productivity are incorporated by the application of output augmenting technical changes on a sector-by-sector-basis. For the ratchet scenarios, the simulation of data regulation-induced price effects is based on an import-augmenting tech change variable, which is also applied on a sector-by sector basis (ad valorem equivalents, AVEs). The latter variable accounts for efficiency improvements or efficiency deteriorations in the facilitation of trade between two regions or countries respectively. The methodology for estimating TFP losses is extensively described in previous work of the authors. see van der Marel et al., 2015 and Bauer et al., 2014. In addition to the internal data localisation measures present above, there are other measures in the EU which are not directly imposing localisation of data, but could lead to similar results. Typical examples of such measures are EU-wide rules that restrict storage of banking information on cloud services. 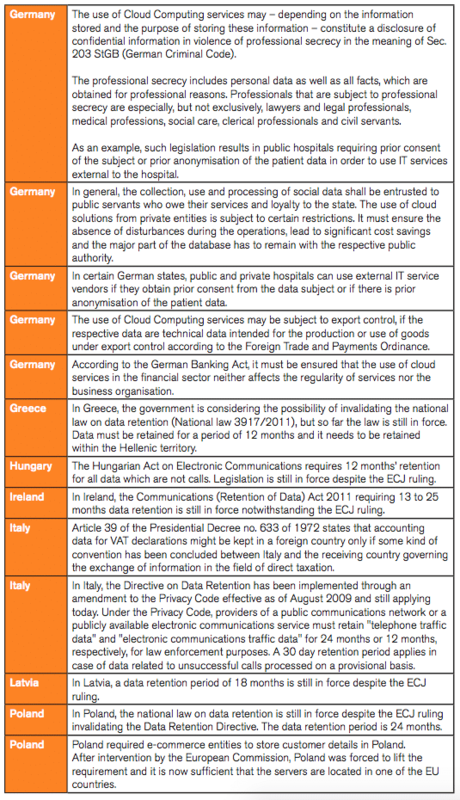 Such requirements do not explicitly ban moving data to another Member State per se, but cloud solutions are likely to be hosted in another EU Member State or elsewhere. 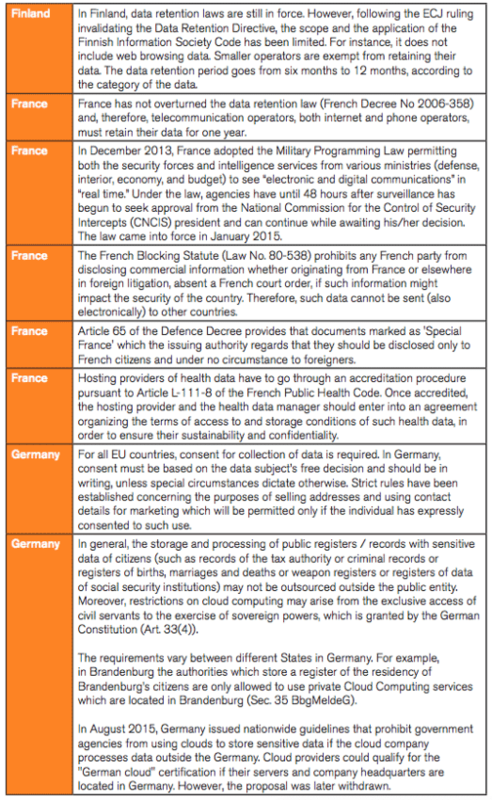 Similarly, the prerogative of the Member States to specify additional conditions beyond the Data Privacy Directive (e.g. for sharing of personal information for marketing purposes) does not necessarily single out overseas data processors, but it is very likely to do so given that authorities would have few legal grounds to exercise their jurisdiction even if the processor is based in another Member State. A special example concerns data retention. Under the Data Retention Directive, which was recently declared invalid by the CJEU, EU telecom operators were required to retain traffic and location data for a period between six months and two years and to make them available to law enforcement authorities. In some Member State jurisdictions, the revocation of the directive is yet to be implemented, and therefore it remains still in force. Even in the cases where it is not required to store the retained data within the country, data retention requirements induce a localising effect as operators must invest in considerable storage capacities in close proximity to a physical infrastructure that is present in the country – making it less likely to invest in additional storage and processing capacities overseas. It is worth noting that many of the measures in this category may not be actionable through a data localisation ban, as they are not explicitly localising and de jure non-discriminatory between domestic and foreign companies. Other measures clearly fall within the scope of the national security exception. Reforming the rules in certain sectors, e.g. banking, entails additional political processes and mandates beyond the scope of DSM. Meanwhile, some of the implicit and indirect requirements here are transitory – for instance, aforementioned Directives on Data Protection and Data Retention have been reformed and revoked, respectively. Directive 2006/24/EC of the European Parliament and of the Council of 15 March 2006 on the retention of data generated or processed in connection with the provision of publicly available electronic communications services or of public communications networks and amending Directive 2002/58/EC. Digital Rights Ireland Ltd. v Minister for Communications, Marine and Natural Resources, C–293/12. Andriamananjara, Dean, Feinberg, Ferrantino, Ludema, Tsigas, The Effects of Non-Tariff Measures on Prices, Trade, and Welfare: CGE Implementation of Policy-Based Price Comparisons, USITC Economics Working Paper No. 2004-04-A. Chander, U. P. Lê, Breaking the Web: Data Localization vs. the Global Internet, Working Paper 2014-1, California International Law Center, 12.03.2014, accessed at: http://ssrn.com/abstract=2407858, 20.03.2014. Bauer, Lee-Makiyama, van der Marel, A Methodology to Estimate the Costs of Data Regulation”, International Economics, 2015. Bauer, Lee-Makiyama, van der Marel, The Cost of Data Localisation, ECIPE, 2014. 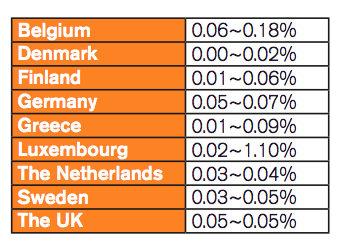 Bauer, Lee-Makiyama, van der Marel, Verschelde, A Methodology to Estimate the Cost of Data Regulations, ECIPE, 2014. Bauer, Lee-Makiyama, Erixon, The Economic Importance of Getting Data Protection Right, US Chamber of Commerce, 2013. Bauer, Lee-Makiyama, van der Marel, Verschelde, Data Localisation in Russia: A Self-Imposed Sanction, ECIPE, 2014. Borggren, New Research: Conflicting Company Data Rules Inhibit Intra-EU Business, Project Disco, 2016, accessed at: http://www.project-disco.org/information-flow/022316-new-research-conflicting-european-accounting-rules-inhibit-intra-eu-business/#.V0s1cVcTWc9. Cushman & Wakefield, Data Centre Risk Index 2013, accessed at: http://www.cushman-wakefield.pt/en-gb/research-and-insight/2013/data-centre-risk-index-2013. De Brauw, Blackstone, Westbroek , EU Country Guide Data Location & Access Restriction, 2013 accessed at: http://www.verwal.net/wp/wp-content/uploads/2014/03/EU-Country-Guide-Data-Location-and-Access-Restrictions.pdf. ECIPE, Digital Trade Estimates, 2016. European Commission, A Digital Single Market Strategy for Europe, SWD(2015) 100, 6 May 2015. European Commission, the Governent of Canada, Canada-EU Joint Study, Assessing the Costs and Benefits of a Closer EU-Canada Economic Partnership, 2008. Foure, Benassy-Quere, Fontagne, The world economy in 2050: a tentative picture, CEPII Working paper 2010-27, 2010. Francois, Reducing Transatlantic Barriers to Trade and Investment – An Economic Assessment, Final Project Report Prepared under implementing Framework Contract TRADE10/A2/A16, 2013. Francois, Economic Impact of a Potential Free Trade Agreement (FTA) Between the European Union and South Korea, Copenhagen Economics, 2007. Greenberg, Hamilton, Maltz, Patel, The Cost of a Cloud: Research Problems in Data Center Networks, Microsoft Research, accessed at: http://research.microsoft.com/en-us/um/people/dmaltz/papers/DC-Costs-CCR-editorial.pdf. Hertel, Tsiga, Structure of GTAP. In Global Trade Analysis : Modeling and Applications. Ed. Thomas W. Hertel, Purdue University. Cambridge University Press. 1997. OECD, Inter-Country Input-Output (ICIO) Tables, 2011. Rentzhog, No Transfer, No Production, National Board of Trade of Sweden, 2015. Rentzhog, Jonströmer, No Transfer, No Trade, National Board of Trade of Sweden, 2014.
van der Marel, Bauer, Lee-Makiyama, Ferracane, A methodology to estimate the costs of data regulations, International Economics, 2015.